The author of this epistle never identified himself by name, but Christians since the beginning of the church have considered this letter authoritative, believing it was written by John the Apostle. That group of witnesses includes Polycarp, an early second-century bishop who as a young man knew John personally. In addition, the author clearly places himself as part of a group of apostolic eyewitnesses to the life and ministry of Jesus, noting that “what we have seen and heard we proclaim to you also” (1 John 1:3). John did not specify the recipients of this letter, but given his addresses in Revelation 2-3 to seven churches in the immediate vicinity of Ephesus—the city where John ministered late in his life—he likely had those same churches in mind for this letter. The letter offers little in the way of specifics, so pinpointing the date of its composition can be difficult. However, its similarity with the gospel composed by John means it was probably written near the same time. A date of about AD 90, with John writing from his exile on Patmos, ends up being the best proposition. 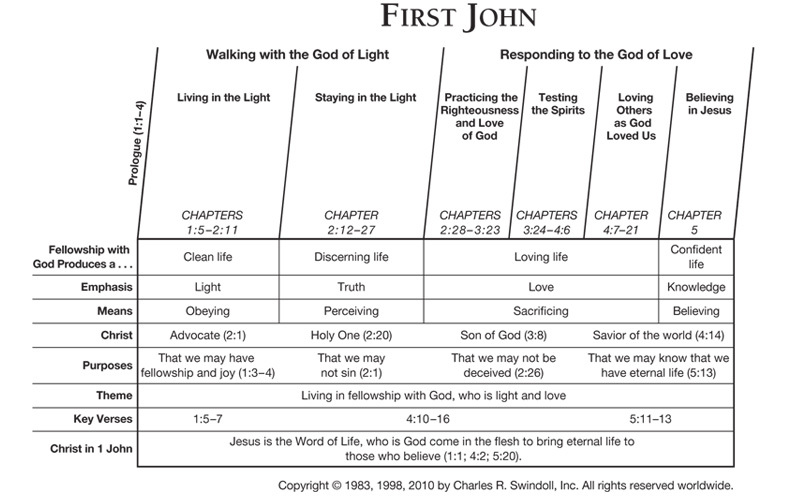 WHY IS FIRST JOHN SO IMPORTANT? The parallelisms in 1 John are striking for their simplicity: Christ versus antichrists, light versus darkness, truth versus falsehood, righteousness versus sin, love of the Father versus love of the world, and the Spirit of God versus the spirit of the Antichrist. While this is not a complete list, it reveals a letter that presents the world in an uncomplicated way—there is right and there is wrong, period. This emphasis by John, while striking, is not without love. It's quite the opposite, in fact. John recognized that love comes from God, and he encouraged the believers to love one another (1 John 4:7). John's first epistle teaches that while it is important to recognize the lines between truth and error, it must always be done in a spirit of love. As he did in his gospel, John stated with clarity the purpose of his first letter. He proclaimed the good news about Jesus to the recipients of this letter, saying “so that you too may have fellowship with us; and indeed our fellowship is with the Father, and with His Son Jesus Christ” (1 John 1:3). Later, John added, “so that you may not sin” (2:1) and “so that you may know that you have eternal life” (5:13). John wanted his readers to experience true fellowship with God and with God's people. But he knew that would not happen until the Christians set aside their own selfish desires in favour of the pursuits God had for them. To help them attain that goal, John focused on three issues: the zeal of the believers, standing firm against false teachers, and reassuring the Christians that they have eternal life. John wrote to churches full of people who had struggled with discouragement—whether due to their own sinful failures or the presence of false teachers in their midst. The aging apostle hoped to ignite the zeal of these believers so that they might follow the Lord more closely and stand firm against those who meant to sow discord among the churches. In doing so, they would solidify their relationship with God and gain confidence in His work in their lives. We all go through ups and downs in our Christian faith. Whatever the struggle—whether outside of us or inside—we often feel ourselves blown about by the winds of emotion or circumstances. Yet God calls us to lives of increasing consistency, with the evidence of our inner transformation becoming more and more apparent as the months and years pass by. How would you characterize your relationship with God—consistent and fruitful or sporadic and parched? John knew that we would never find in ourselves the faithfulness God requires. Instead, we have to place complete trust in the work and grace of God, believing that He will certainly conform us to the image of His Son, Jesus. That sense of being grounded in God only comes when we set aside our sin in the pursuit of the one true God. Or, in the words of John, “if we love one another, God abides in us, and His love is perfected in us” (1 John 4:12). Find resources in the book of First John in our resource library.